Located in the state’s geographic center, about an hour and twenty minutes’ drive southeast of Atlanta, Macon is known as “the Heart of Georgia.” The city along the Ocmulgee River traces its founding to a 19th-century fort at the waterway’s mouth. The region’s military roots endure today, as neighboring Robins Air Force Base continues to serve as a home to for the 78th Air Base Wing. To the world outside of central Georgia, Macon may be known best for its music history—once the home of Otis Redding, Little Richard and the Allman Brothers. The region surrounding and including Macon, encompassing five counties in central Georgia, is home to 175,662 adult residents. 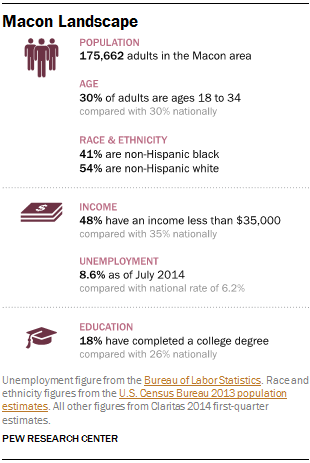 (For a display of all city demographics, click here. )11 The Greater Macon area is also home to a sizable African-American population: 41% of its adult population is black. Aside from Macon—the principal city within the Greater Macon metropolitan area—this region of central Georgia is largely rural. The Macon area’s news environment revolves largely around a relatively small list of traditional, established media organizations as well as some municipal websites and social media pages that offer ways for residents to keep up with local affairs. Researchers identified 16 dedicated news operations that provide the majority of the reporting power in the city of Macon and the suburban and rural communities that encircle it. These include 10 print publications, from the leading daily newspaper to weekly community papers and niche publications, along with a university newspaper. While there is relatively little radio news presence, three of the major network television broadcasters operate in the metro area, along with an independent station. The majority of local publishers have some form of web presence, but it is limited. All of the local broadcasters maintain a website. 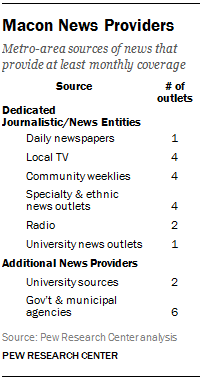 But of the print publications, just four have active websites updated with local news on at least a weekly basis. Others either publish less frequently, have gated access, or simply offer the website as a way to subscribe to the print edition. The area has no major digital-native news publishers. When it comes to social media, the majority of local outlets operated and regularly updated their social media pages, including Facebook and Twitter, at the time of study. In many ways, the heart of journalism innovation is emerging from Mercer University, whose Center for Collaborative Journalism (CCJ) is home to Groundsource, a mobile community engagement tool, and other initiatives to connect residents, students and professional journalists. In addition to the dedicated journalistic enterprises, Pew Research analysts identified eight sources that, within their offerings, provide original news and issue-related (local) content at least monthly. In Macon, these ranged from municipal websites and news services of a local university to the page of a local congressman. While sites that provide event listings or services like bill paying are valuable elements of community information, they are beyond the purview of this study and not tallied here. The Telegraph remains the region’s primary paper and a key source of news production. It launched as a weekly paper in 1826. While other area newspapers and magazines (such as The Atlanta Journal Constitution and Georgia Trend magazine) may occasionally run a story featuring Macon, these publications lack dedicated manpower in central Georgia. However, The Telegraph’s footprint is smaller than it used to be. 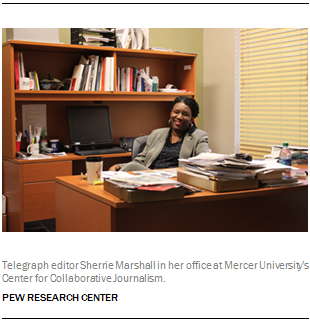 According to the executive editor, Sherrie Marshall, 13 years ago, The Telegraph was a “regional paper” with a presence in more than 30 counties and an office in Atlanta. Now, she says, the paper focuses its resources primarily in five core counties. (The paper is still circulated in about 28 counties, though, and provides some coverage—such as sports and public safety—in many of them. )13 The Telegraph has a daily circulation of almost 34,000. In an interview, Marshall described the core identity of The Telegraph as that of a “watchdog,” holding local institutions accountable. And increasingly, in part spurred by its partnership with Mercer’s CCJ, the paper has taken steps to ramp up its community outreach efforts. One such effort, called Macon in the Mirror, had journalists and students fan out into the community conducting around 600 interviews with local residents to ask them questions about their concerns (the most consistent answer: blight). Macon’s television viewers can choose content from three primary newsgathering outfits. As Central Georgia’s first VHF station on the air in 1953, Macon’s CBS affiliate WMAZ originally broadcast from Mercer University (its call letters, in fact, stand for Watch Mercer Attain Zenith). Today, the Gannett-owned station dominates the ratings within Macon, drawing about seven times as many viewers as its closest competitor, according to data obtained from Nielsen Media Research. The CBS affiliate also garners the greatest Facebook activity of the region’s broadcasters, attracting nearly 90,000 “likes” at the time of study. WMAZ shares its content with the local CW affiliate. Macon’s CBS station did not gain a news competitor until 1968, when an NBC affiliate joined the fray (the station originally had the call letters WCWB but changed to WMGT in 1983). In 1992, the NBC affiliate, seeking to cut costs, closed its news department. For more than a decade, the station did not produce local news in Macon. The station, better known to local viewers today as 41 NBC, chose to revive its news department in 2004. Beyond The Telegraph and local TV affiliates, four community papers serve smaller towns in the Macon metropolitan area: The Monroe County Reporter, launched in 1972, calls itself the “No. 1 source for news and advertising in Monroe County.” The Jones County News, launched in 1895, focuses on Jones County and the city of Gray with a staff of six full-time employees and two part-timers. The Georgia Post and Twiggs Times New Era also serve smaller communities, and unlike the other two, are limited in their web offerings: The Times New Era offers a replica edition to subscribers only, and the Georgia Post does not appear to have any website at all. In addition to The Telegraph, residents living in and around Macon have access to a trio of niche publications with more targeted readerships. The 11th Hour, an alt-weekly with zoned editions in three areas of central and southern Georgia, is available free on newsstands. The paper is known for its offbeat columnists and its in-depth coverage of the region’s arts and entertainment scene. Readers in the area also can access Macon Magazine, a bimonthly publication covering lifestyle and culture in the area. The local Hispanic community is served by a monthly publication covering central and southern Georgia called ¿Que Pasa?. 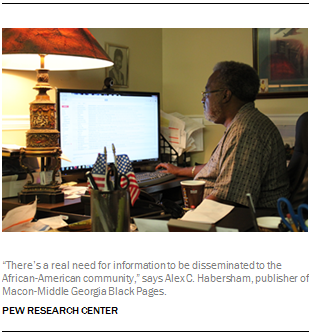 Within the Macon area, researchers did not identify a single active, digital-only outlet devoted to news reporting. There are some local and regional blogs, such as We Are Politics and Peach Pundit. However, neither of these was posting local content at least monthly during the period of analysis. Macon Community News, which once had a vibrant web presence, curtailed operations in March 2014. As of July 2014, very little neighborhood-level content is routinely published within and around Macon. And Macon and its surrounding communities lack a single news nonprofit. During the academic year, Mercer University’s student paper, The Cluster, covers campus life and the surrounding neighborhoods. It claims a bimonthly print circulation of 1,300 copies, distributed around campus and in Mercer Village and downtown Macon. 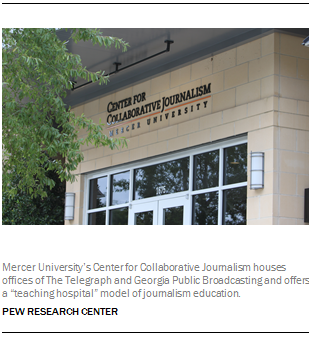 In addition, Mercer’s Center for Collaborative Journalism is ground zero for journalism innovation in Macon, housing offices of The Telegraph and Georgia Public Broadcasting, and serving as a “teaching hospital” model of journalism education for students at the university. CCJ is also the home of Groundsource, a project being launched by CCJ entrepreneur-in-residence Andrew Haeg. Currently in beta form, the effort seeks to integrate community members into the local information ecosystem via mobile devices. Finally, the local radio news market is quite small. Georgia Public Radio’s WMUM-FM 89.7 provides general news and information for the area’s residents, and, according to Tim Regan-Porter, director of CCJ, reaches about 30,000 listeners. Another local news/talk station, WMAC, offers local news updates on the hour. In addition to dedicated news entities, many local areas have a range of organizations that provide some kind of news-related offering. The content produced tends not to be original news reporting but instead provides updates on policies or planning initiatives, such as ways residents can save water during a drought, or explaining the political activity of a local leader. In Macon, the most active of these is the Macon-Bibb county government. Elected leaders in Macon-Bibb County have pledged to continue investment in municipal broadband, with the hope of creating a “wireless core” in the city’s downtown. In its strategic plan, the newly formed Macon-Bibb government also placed direct communication to citizens through its website and social media accounts as a top priority. However, city agencies (as well as the county’s public schools system and public library) post to their respective webpages rather infrequently. The city’s emergency management website, in fact, was dormant for several months in late spring 2014. And while other community organizations, such as the city’s Chamber of Commerce and the Macon Arts Alliance, provide monthly or quarterly updates to the community, these outlets are not primary sources of news and information for those living in Macon. MaconBibb TV broadcasts committee meetings and public forums online and on its television channel. According to Chris Floore, who deals with public affairs for the county, it was averaging 19,000 web visits per month at the time of research.16 (Earlier, the county was producing 50 to 60 hours of programming per week but was securing little audience reach. It still broadcasts from channel 14, but the Web is what leads.) MaconBibb TV offers several shows dedicated to local news, including public affairs programs such as “Up Next With” and “A Call to Action,” which residents can watch on demand through YouTube and Vimeo. In addition to a handful of local municipal offerings, one local member of Congress, Rep. Austin Scott, publishes occasional news and information, largely consisting of press releases, to his website. Aside from its student newspaper, the Cluster, Mercer University maintains two websites, one focusing on university news and the other on Mercer sports. Both websites remain active during the summer. The institution spotlights its athletics teams, producing near-daily coverage—including full stories and profiles—during the academic year. As the university reinstated Division I football effective in the fall of 2013 and as the Mercer Bears basketball team had a Cinderella-esque run deep into the NCAA Tournament in spring 2014, the production of sports news appears to be an area of growing content in the city.